1 Can I drink the infusion of tea fungus? 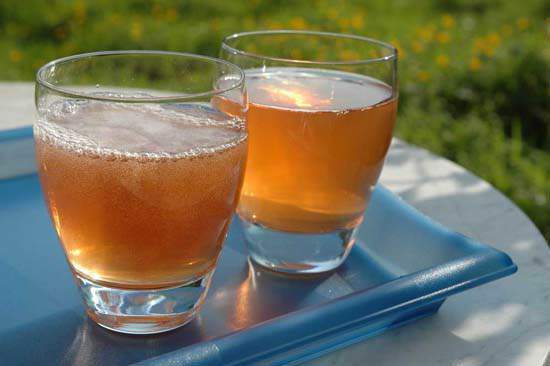 Amazing "tea jellyfish" or "kombucha", which floats in the bank and preparing us delicious drinks, fermenting sweetened tea solution of, Russia has brought in more than a hundred years ago from Japan. Can I drink the infusion of tea fungus? Many people often wonder - how useful such a drink, how to drink, there are no contraindications to its use? This drink is very useful, on cheer, great thirst quencher, It contains a number of enzymes, vitamins, various essential body substances and compounds, It has virtually no contraindications. You can drink it all, as an adult, and children, It recommended it only for diabetics and patients with high acidity and ulcer. Often used in the treatment, cosmetic purposes and in everyday life. Prepare infusion for drinking, placing the Kombucha tea in a jar with a solution of warm tea slabozavarennogo, sweetened, the rate of 120 d of 1 l.
Drink it possible for healthy people as much as you want, but better postprandial, because it stimulates the digestion. But if there are problems with digestion, it is better to drink a special, therapeutic infusion of 2-3 hour before meals (infusion for the treatment is done with half the norm of sugar per liter of weak tea, about 30-50 g), Children can be given a little drink before a meal for appetite. note, that the infusion has to be constantly updated, you need to keep it no more 6 days, and in the summer to change twice as likely, washing fungus. Do not use long standing solution, it becomes harmful to the body, as it formed harmful bacteria and microorganisms. To take preparation per liter of boiled and cooled water 1 Article. a spoonful of instant coffee and sugar to taste, Stir and put the mushroom to ferment. Curious taste gives drink the solution from pea flour, it resembles some exotic fruit juice. To prepare a solution, Take per liter of chilled water 0,5 ch.l. pea flour and sugar to taste. The drinks, obtained by means of Kombucha, really natural, helpful, They do not contain any harmful preservatives and dyes, successfully replace any manufactured industrially, Besides, save money.